First, it's okay to be nervous. Just about everybody is. If you think about it, this normal because you're about to meet with a stranger to talk about your personal life. If you're like most people, you've already begun to think about what you might say. And yet, even as you say it to yourself, well, it sounds crazy. You wonder, do you really need therapy, after all? And who says this process will actually help anyway; it's just talk, after all. How does talking help people? Can't your just talk one of your good friends? Then again, you're tired of feeling the way you feel. Whatever the problem is, you're sick of it and you want it to go away. You're tired of feeling stuck. If the problem is serious, maybe you feel stuck and embarrassed or ashamed. How did it come to this? What will this guy think of you? Will he judge you? Diagnosis you? So you go to your first appointment. When you arrive in his waiting room––is this the place?–-you see that it's not nearly as big as your physician's office. No one else is there. Just you. 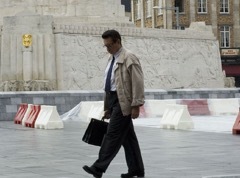 And then him, when he comes out of his office to greet you. He invites you into his office. Oh my, he actually has a couch. Are you expected to lay down? Is this psychoanalysis? If it is, this isn't what you signed for. He smiles. No, he says, the couch is for sitting. The couch comes in handy when couples come to his office. So you sit down. Your anxiety has spiked a bit, especially when he asks you where you'd like to start. Hey, isn't that his job? Isn't he supposed to ask lots of questions...? Hi. I'm Dr. Gibson, but please feel free to call me John. Take a moment to settle yourself. A deep breath sometimes helps. And take your time; we're not in a hurry. Start anywhere. Yes, I'll help you with questions. (What's the problem? Can you give me and example of the problem?) My goal at this point is to listen to carefully to you to make sure I understand things from your point-of-view. You may wondering whether I’ll think your crazy, bizarre, or abnormal. Well, I’ll let you in on a little secret: everybody has problems and issues, even psychologists. It's difficult to be human and not have problems of one sort or another. You may be worried about whether I’ll secretly pass judgment on you, especially if you reveal some of your darkest thoughts and feelings, your problems, or stuff you done that you’re proud of. To the contrary, passing judgment rarely helps anybody. Showing compassion, however, does. You may worried you’ll be “just another case of [x],” and that I’ll come across as too clinical. But nothing could be farther from the truth. My clients are people, not cases. They have distinct personalities, feelings, hopes and dreams, and yes, distress. I'm in the business of investing in people, in helping them create new possibilities. A case is something you study; a client is someone you help. Although first session often feels unsettling, most people find themselves relaxing into it as we proceed. In part, this because they are putting their problems into words, and frankly, this can be helpful in and of itself because it often permits the release of negative emotions. But also, most clients come to experience me as an ally, a person who joins forces with them against their problem. Obviously I cannot do psychological work for my clients, but I do know the territory pretty well. I am a resourceful guide. At the end of your first session, you'll want to ask yourself how comfortable you feel talking to me. In therapy (as in life) fit is everything. Not every individual or couple naturally fits with every therapist. You want to feel understood, and know that this therapist has experience with your type of problem. Therapy is not friendship; it's a professional relationship that's asymmetrical relationship by design. Unlike friendship, which has a natural give-and-take, in therapy the focus is always on you. Welcome. Let's make therapy a productive experience for you. Sometimes people will come to therapy hoping that I can make their anxiety disappear, as if by psychological surgery. Almost as if anxiety is the psychological equivalent of an appendix. But therapy doesn't remove anxiety so much as help you learn to dial it back. If your anxiety (apprehension, worry, panic attack, social discomfort, performance anxiety, etc) is running at about an 8 or 9 on a scale of 1 to 10 with ten being high, dialing it back to a 4 or 5 can make a huge difference. Anxiety is an emotional state that signals danger or threat or concern. We don't want to cut this out of your psyche. You need this signal. Life is sometimes dangerous or threatening. But too much anxiety, especially without the governing power of reason, spells trouble. Avoidance becomes its own problem. Avoidance robs you of life. If anxiety is robbing your life, get help. Dare to try to therapy. Sure, you can read this blog post or read a book, and these are great ways to get information, raise awareness. But therapy helps you implement information. Therapy is an experience. If you dial back your anxiety by just a few percentages points, you might live just a bit more fully. You might enjoy being alive again. I do not post information about my actual clients on this blog because therapy is a strictly confidential. This is as it should be. And yet I also think it's helpful for people who are thinking about trying to therapy to get a feel for how therapy works and what we talk about. He could be young, old, male or female. He could be white, black, latino. He could be you, me, or your neighbor. 1. What are the sources of his depression? Not the causes; causes are an entirely different matter, and they are complicated. But the sources. Most people who become depressed ruminate over certain aspects of their lives. Job, family, kids, failures, whatever. What I'd want to know is where does the rumination take him? First we follow the problems. 2. How can we make the problems solvable? Frequently when people become depressed, they become overwhelmed. Problems become mountains to climb and oceans to swim. In a depressed state, problems often seem impossible. As first step, however, we need to break the problems into solvable parts to make them more manageable. Therapy isn't just about talking out your feelings, it's about finding new actions to take. 3. Can we take a close look at his thinking patterns? Depression is a sad emotional state, true, but it is also a kind of thinking disorder. In the throes of depression, thinking gets muddled and distorted. Has our Hypothetical Client fallen into the trap of black or white thinking? (e.g., either I'm a success or a failure. Either I can do it right, or I can't do it at all. Hint: where is grey?) Or has he become a master of extracting negative information from all situations, while ignoring or dismissing the positive? We're not always aware of our own thinking patterns. We just think the way we think, and it feels natural to us. This is where I come in. I've spent countless hours helping people identify ways their own thinking is making problems worse. This isn't the full story of what treatment for our Hypothetical Depressed Person would look like. Therapy is a complex business that is tailored to a specific individual (or couple). But maybe this gives you a taste of how a therapy for a depressed person might start. 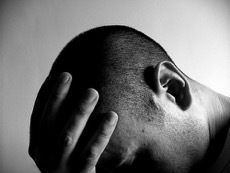 For more information, check out these related posts: The Downward Spiral of Depression. And Tip for Coping with Depression. What are the consequences of soul-less work? You fantasize about getting out. You are bored, disengaged, or numb. You are not creative or original. You are not as productive as you could be. You postpone living until retirement -- then you can live. You compensate. Food. Alcohol. Possession lust. Mindless entertainment. You become selfish, ego-centered, uncaring, immune to the pain of others. For the dads who stop by my blog every now and then, Happy Father’s Day. Some years ago, when my daughter was a toddler, a friend who was not a parent asked me what it was like to be a parent. I thought for a moment, and then told her that so much of parenting could be assigned to two categories: sacrifice and joy. So much of good parenting is about putting your kids first. Good parents sacrifice time, energy, needs, money, sleep, and more for the sake of their children. This is just part of the job description, and good parents do it willingly. But being a parent is also about great joy. Few things in life have given me as much joy as being a father. Whatever else I am, or try to be, I am that guy in the stands of life who is always rooting for his daughter. The joy I get from watching her grow and discover life is worth more to me than I say. Although it’s very common for individuals to call my office in search of Cognitive-Behavioral Therapy, it’s rare for someone to call and ask for Psychodynamic Therapy. And yet recent research has now shown psychodynamic therapy to be an “evidence-based” practice. In other words, research shows it works. (Click here to see the article featured in Scientific American. This article highlights the work of Jonathan Shedler, who conducted a meta-analysis to show that psychodynamic therapy is indeed effective. Meta-analysis is a sophisticated statistical technique for putting studies on a common yardstick so that can be quantitatively compared). Well, for starters it’s not psychoanalysis, though many people erroneously equate the two. Whereas cognitive therapy places emphasis on cognition or thought, distorted thinking, and dysfunctional beliefs, psychodynamic therapy places emphasis on emotion, processes of self-deception, anxiety, and hidden feelings -- in the context of relationships. Whereas cognitive therapy stays strictly in the here-and-now, psychodynamic therapy places symptoms and problems in the context of one’s personal history. Whereas cognitive therapy relies heavily on psycho-education (how thoughts influences emotions and behaviors), psychodynamic therapy relies on discovering patterns and themes in the patient’s psychological life, which may be just outside of the patient’s everyday awareness. Cognitive therapy has received a great deal of air-play in the last couple decades, so people are aware of it. And frankly, unlike psychodynamic therapy, cognitive therapy is easy to understand. But some problems do not yield to cognitive interventions. Sometimes we really do need to get dig just a bit deeper into the psyche to resolve certain types of difficulties. Psychodynamic therapy is one way to go about that. It’s nice to see researchers put their stamp of approval on the method. A recent article in the July 2010 Consumer Reports presents the results of a survey they did with their readers about getting help for Anxiety and Depression. Conclusion: their sample of readers felt both that both “talk therapy” (psychotherapy) and medication were each effective, but combining the two yielded the best results. I often see people in my practice who do not want to go on medication, largely because of side effects. I’m not against medication; I just happen to provide therapy. If my patients want medication I will happily refer them and let them come to their own conclusions about the value medicine in their lives, which I think is the best way to do it. On occasion, I will also see a patient who does not want talk therapy, but only wants the pills. I have no objection to this, either. What I do find, however, is that often medication treatment alone is good so long as one stays on the medication. If the medication is discontinued -- without psychotherapy -- the symptoms may relapse. This, too, is in line with current research. A different view of antidepressants was discussed in this post: Antidepressants Don’t Work...Can this be true? Looking for a Change? What's holding you back? Maybe you want to feel better or do better or make some personal habit change. Maybe you’re fed with the emotional or behavioral status quo, whatever it is, and you tell yourself you want to change, but something -- something almost as powerful as a magnetic force -- pulls you back. What is that something? Could be any number of things. Here are some possible candidates. Awareness. Obviously, changing anything about yourself starts with awareness. First you must be aware that you have a problem. Of course, it’s not awareness that holds you back so much the things that block awareness: minimization, rationalization, blaming others, and denial. These things are like veils that keep you from seeing the true consequences of the problem or issue. First step: lift the veil. See reality clearly. Motivation. Recognizing that something is a problem doesn’t necessarily mean you’re motivated to do anything about it. Indeed, many people wait until the consequences of having the problem outweigh the discomfort of facing it before they embark on change. But it doesn’t have to be this way. You can make a list of the consequences to build motivation. And you can make a list of the benefits of change. Willingness to tolerate anxiety or discomfort. Almost of any change generates anxiety or discomfort as you move out of your comfort zone and experiment with new thinking and action. Human beings are nothing if not self-consistent. Stepping out of old grooves, even grooves that are ultimately not in your best interests, will trip the alarm in your psychological system. Anxiety or discomfort is an uncomfortable state. To make it go away, you revert back to old patterns. But this is a trick. This is what keeps your stuck. If you’re serious about change, you must be willing to bear a bit of discomfort. Know-how. Knowing how-to lose weight is not the same as knowing how-to get undepressed or how-to conquer agoraphobia. Problems vary and solutions vary. Do your homework. Study the strategies that others have used to solve your particular problem. Don’t re-invent the wheel if you don’t have to. Support from others. Change is something you can do alone, but it’s probably easier when you have someone in your camp who is willing to root for you. Someone who knows not only what you’re doing, but why you’re doing it. Someone who cares enough about you to pick you up when you stumble. Never underestimate the value of supportive relationships. Conversely, be wary of those individuals who have something to gain if you fail. (e.g., domestic violence). Willingness to exert effort. If only the infomercials were correct: that there really was such a thing as effortless change. But real change -- change that endures -- requires hard work. You must focus on the problem, think about it, feel the discomfort associated with it, come up with strategies or solutions, and start anew when lapses occur, as they most certainly will. If a problem is really a problem, you must be willing to throw some effort at it to make it different. Maybe that means reading books, tracking progress, attending therapy sessions, or just keeping the problem front and center for a while. No one will do for it; indeed, no one can. If you are trying to change, don’t be discouraged by lapse, relapse, or resistance. To the contrary, expect these things. They’re simply part of the process. If you are trying to change, know that change is seldom linear. It’s two steps forwards, one step back (or maybe sideways). Learn to look at the trend, not the moment. If you are trying to change, celebrate your victories. We never outgrow our need for praise. Being an adult, however, means that sometimes we must provide it for ourselves. If you are trying to change, but you are not there yet, give yourself the gift of self-compassion. There is little be gained by treating yourself badly when you aim at a target and miss. The rule of change is always about successive approximations, not absolutes. For so many problems, the secret to real change is not in the strategies but in the persistence. You must try and then try some more. Persistence, along with the belief that you can change, wins the day. The National Institute of Mental Health has a great page devoted to anxiety disorders. You can find it here. Generalized Anxiety is worry, worry, worry, and then more worry. The worry switch just won’t turn off. A panic attack is akin to intense fear or terror -- but without any obvious event or stimulus to provoke it. OCD is repetitive behaviors (compulsions) and repugnant thoughts (obsessions) that one cannot stop. Social Anxiety is dread of common social circumstances. PTSD is intrusive thoughts, flashbacks, extreme avoidance, intense anxiety, all tied to a prior highly stressful event. We must differentiate normal anxiety for disordered anxiety. Anxiety in and of itself is not bad; indeed, we are all biologically equipped to feel it. When it comes to performance, for instance, anxiety can be quite helpful. Without some anxiety, the athlete, the musician, and the test-taker would suffer. A moderate amount of anxiety increases alertness, focus, and energy. As it turns out, performance tends to suffer when anxiety is either too low or too high. When anxiety is too high, it disrupts our abilities to concentrate and focus, to remember and process information, to feel calm, and to function. Although we think of anxiety as an emotion, it affects thinking, behavior, and body as well. Anxiety disorders frequently coexist. One may be both a worrier and a panicker at the same time. This probably because the disorders -- which are really symptom patterns -- may share the same underlying mechanisms. The goal of treatment is not to eliminate anxiety, but to dial it back to acceptable levels. The American Psychological Association has posted a good article on anger. You can find it here. If you haven’t already seen it, you might check out Gretchen Rubin’s Happiness Project. She is the author of the book by the same name. Hers is one of my favorite blogs. It takes a bit work to find the right therapist, doesn’t it? Do you go with a psychologist (PhD), social worker (MSW), or counselor (MS or MA)? Do you search for a therapist who is the same gender as you, or who is about the same age? Can you rely on your insurance company to point you in the right direction, or should you ask around to find out who’s good? Or do you just figure they’re all pretty much the same, so why not hunt for the therapist with the lowest rates? Well, folks, here’s what the research says. Age, gender, and academic degree have not been show to be strong predictors of therapist effectiveness. In other words, men can do effective work with women (and vice versa) and young therapists can work effectively with older clients. Moreover, psychologists tend to be just as effective as social workers or practitioners with other degrees. What does matter is whether your therapist has had experience with your type of problem, and how comfortable you feel when you talk to him (or her). These are the two things you should be looking for. It’s relatively easy to determine the therapist’s level of experience (you can do this from a website, or a quick telephone conversation). But the only way you can truly figure out how comfortable you feel talking to the therapist is to make an appointment and try him out for a session. So much of what happens in therapy depends on the therapy relationship itself. Our dentist or physician may work on us, but our psychotherapist can only work with us. We must trust her enough to disclose highly personal and private information, and we must rely upon her support as we confront those aspects of ourselves that we feel least proud of. Don’t pick your therapist on the basis of gender, age, credential, race, reputation, or price. Pick him (her) on the basis of his experience and how comfortable you feeling sitting across from him in his office. Anxiety and avoidance go hand-in-hand. Where you fine one, you find the other. When I help people reduce or eliminate panic attacks, we often have two goals: reducing the panic attacks themselves, and reducing the accompanying agoraphobia. A panic attack is an intense state of fear or terror without an obvious external stimulus. When people experience panic attacks over a period of time, they tend to avoid those places where the attacks occurred. When the avoidance gets to a point people have many places they simply refuse to go (e.g., busy traffic, large city, a large supermarket), we give it fancy diagnostic label: agoraphobia. When you’re trying to break an agoraphobic pattern, it helps to differentiate between avoidance and retreat. In the former, you avoid a physical place like crazy and try never to come back. In the latter, you may back away, but only because you can’t do it right this moment. The kicker is, with retreat you make agreement with yourself to come back to it. Maybe later today, maybe tomorrow, maybe next week or next month. But sooner or later you come back to it and -- this hard part -- you hold yourself to it. Some clients will say I’m splitting linguistic hairs. And to degree that’s true. But the truth is, our ability to cope is not static. Some days we are better others: more rested, less stressed, more ready to face challenges, more courageous. When you are trying to break an avoidance pattern you will most likely not get it right on the first try. You need to try and try again, and keep trying. So if you approach something you fear, and can’t do it, you can either throw up your hands and give up, or make an agreement with yourself to come back to it. This is really all about building the right mindset. If you simply avoid, you build a mindset of failure. If you retreat, you build a mindset that makes allowances for approximations, false starts, and variable coping patterns. You also build a mindset of self-compassion, which is a critical ingredient in the world of personal change. Another post for anxiety and/or stress: A natural cure for anxiety and stress: belly breathing. Usually when people are depressed they struggle with motivation, fatigue, low energy, or inertia. It’s so tempting just to sit in a chair for hours, go to bed, or come to a complete stop. Why bother doing anything? But this only makes depression worse. Curiously enough, the human body makes energy by exerting energy. Whereas more stopped-ness makes more inertia. The cut-it-in-half rule says, If you can’t go what you usually do, cut your efforts in half. Don’t succumb to all-or-nothing. (Either I worked to my usual capacity, or I didn’t. EIther I succeeded, or I failed.) If you can’t manage your usual effort, try cutting it in half. When it comes to depression, some effort is always better than no effort. Related post: The Downward Spiral of Depression. I agree with his statement. Psychologists, for instance, do not change people. But they do help people change themselves. What’s the difference? Better yet, why bother consulting a psychologist if all help is self-help? Answer: what psychologists really do is help you understand the emotional elements behind resistance. When we try to change something about ourselves, we take a step or two but soon fall back to old patterns. Why? Why do we have this contradiction in ourselves? This is what a psychologist tries to help you understand. You may consciously will new behavior to come about, but if it fails, is there a belief or feeling or schema that’s holding you back? Probably. Human beings are remarkably self-consistent, even when the behavior in question is maladaptive. If you want to change, you’ll have to de-automate the pattern. (Yes, I just made that word up.) If the problem is serious -- depression, anxiety, eating disorder -- it’s not likely to yield to willpower alone. You’ll have to dig deeper. Antidepressants Don't Work...Can this be True? According to research published last month in THE JOURNAL OF THE AMERICAN MEDICAL ASSOCIATION, antidepressants are being challenged as an effective treatment for depression. 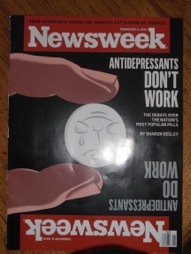 The cover story for NEWSWEEK (Feb 8, 2010) gives an excellent report on these new findings. For mild, moderate, and severe depression, antidepressants are virtually no better than a placebo. However, antidepressants have been found to be effective for very severe depression. In this case, Irving Hirsh used 48 studies, taking pains to gather all of the studies he could find. He went so far as to use the Freedom of Information Act to obtain unpublished studies by drug companies that were available through the Food and Drug Administration. The end result? For the most part, antidepressants are no better than a dummy pill. The drug companies have some explaining to do. Incidentally, they are not disputing the findings of their own studies, but they are trying to point out the depression is an individualized illness and that patient responses may vary. Still, we're talking about a multi-billion dollar industry here. We're talking about big news. No doubt, we're bound to here more on this story in the comming months. In the mean time, if you are taking an antidepressant, do not stop abruptly. This can be dangerous. Consult the person who prescribes them to talk over what's best for you. One last point: psychotherapy has been show to effective in treating depression. And compared to antidepressants, the relapse rate is lower, too. Sometimes in therapy we need to focus on emotional reactions to situational problems. A common example of this is the person who is in the throes of a stressful experience. A divorce perhaps, or a job loss, or maybe the death of a family member. In these instances, we try to help the person marshal their resources and figure out healthy ways to cope with a difficult and painful situation. But what does it mean to dig deeper into the psychological soil? Symptoms related to depression and anxiety are often tied to underlying issues that have to do with dysfunctional beliefs about oneself (or others), or with feelings that have been avoided because they are simply to painful to tolerate. Sometimes we speak of schema -- packets of information that contain beliefs, emotions, memories, sensations. Schema help us navigate the world because they allow us to make use of prior knowledge. But schema about oneself, especially if it is negative, can color the way we evaluate our personal experiences. If one has a schema, for instance, that one is inadequate, inferior, or defective in some way, one is much more apt to selectively filter out information that refutes this notion but allow information in that confirms it. In therapy, going deeper often means uncovering these schema and examining them for truth. The thing about schema is, we often develop them when we are very young, which is say, when we are not yet mature, experienced, or wise. And because they've always been there, or so it seems, we seldom question their validity and we don’t always appreciate the long shadow they cast over our lives. Because schema are often planted early, they are not easy to uproot, especially by oneself. But this is precisely what a therapist can help you do. We can dig deeper. Uproot the bad. Save the good. Help replant as necessary.